Cover letter example for a catering assistant role. Amend as suitable and start writing your own letter in seconds. Further to your advertisement for a catering assistant, I would like you to consider my application. I have worked in my current position for some time and have experience of many different tasks within the kitchen environment. I now wish to progress to a larger establishment, and as your company has an extremely good reputation I would enjoy the opportunity to improve my skills. I have enclosed my CV which shows the courses I have taken at the local catering college and I enclose references from my tutors. I understand, from the advertisement that you require your new catering assistant as soon as possible. If I am fortunate to be offered the position, I would be available to commence working within a few days as I have some holidays due to me. Although I am looking to further my experience, the time spent with my present employer has been really useful and I have learned a huge amount. My manager is aware that I am looking for a position at a larger company, and will be happy to supply a reference. I would be pleased to attend an interview at any time convenient to you. I look forward to hearing from you in due course. 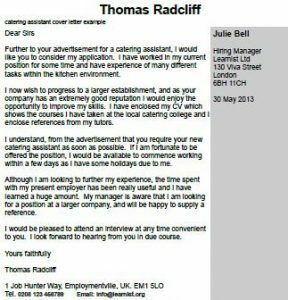 View more cover letter examples?